Gentleman Quaker [H5584] - $10.00 : Yarn Tree, Your wholesale source for cross stitch supplies. Cross stitch pattern by Jardin Prive. 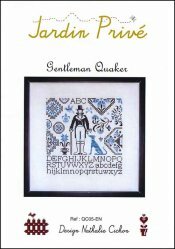 A gentleman and his dog surrounded by Quaker motifs and alphabet letters. Stitch count 160w x 160h. Stitched on #2181 Belfast Linen antique white.